Despite the fact that red is the devil's color and calling it "scarlet" borders on moronic...Michigan and Ohio State both have iconic home uniforms. This season, as Jim Harbaugh descends into this series like a bull in a china shop, marks the perfect time to start this new wonderful tradition. Whether played in Ann Arbor or down in the snake pit, both Michigan and Ohio State deserve to play in their standard-issue home jerseys. I don't care if it's never happened before. Just because something has been done a certain way 111 straight times doesn't make it right. "Scarlet" and blue are naturally situated far enough away on the color wheel as to not be commonly confused or difficult to distinguish no matter what light they are viewed in. Also, Michigan's numbers are yellow* and Ohio State's are white. Michigan's helmet was literally designed to stand out while Ohio State's boring silver helmet does not. The Buckeyes wear gray pants, Michigan wears yellow*. Of course, this is not a novel idea. Other teams do it. USC and UCLA have currently been doing it since 2008, which was actually a tradition that began in this series long before that. Hey look at that…red and blue on the same field. In 2009, the NCAA actually ruled that teams could petition their conferences to allow exceptions to be made on a game-by-game basis. Before that ruling, teams would be docked 1 timeout for showing up to play an away game in their home uniforms…which actually happened when Pete Carroll did this at UCLA before the new rule was implemented. As a courtesy, UCLA coach Rick Neuheisel immediately burned a timeout to even the playing field…something neither Harbaugh or Meyer would ever do, btw. Other examples of cats and dogs living together: Oregon/Oregon State, Georgia/Florida, Tennessee/NC State. With the proliferation of 3rd jerseys and alternate uniforms, wearing non-white unis on the road is trend that will only continue to grow. 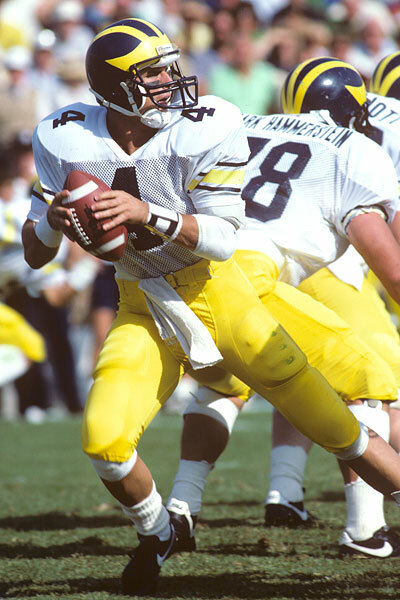 And while Michigan continues it's quest to find an away jersey that even remotely comes close to the one our head coach used to wear in terms of looks and aesthetics, I see this as nothing less than something that needs to happen right quick. Call you congressman, athletic director, league administrator...tell your pastor/priest/reverend/rabbi/bishop…broadcast this on all of your social media outlets. We need to make this happen! *= Yes, Michigan's jersey numbers pants are yellow, not maize. Seriously, scroll up and look at the pic from this year's game in Columbus. The maize wings on the helmet and the yellow pants don't match. Get on this adidas. Despite the fact that yellow is the coward's color and calling it "maize" is moronic...I agree.